Although church programs are good and needed to edify believers, Jesus told us in Matthew 28 to go and make disciples. One program MACC uses to fulfill this command is Mission Macomb. Mission Macomb organizes mission trips right here in our town that allow our church family to use their God-given gifts and talents to reach our community. While painting homes, repairing roofs, and building fences, MACC members reach out to those in need in Macomb. Jesus shows us examples such as this in the New Testament-meeting the physical needs of the people allowed Him to meet their spiritual needs. 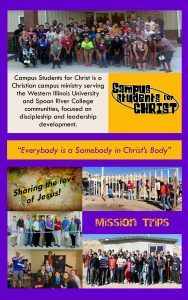 Campus Students for Christ (CSC) – CSC is a Christian student-housing facility ministering to the Western Illinois University community. 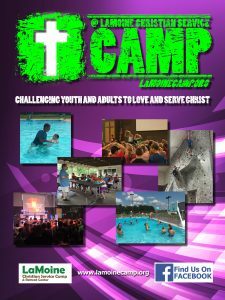 The group provides worship services, Bible studies, and Christian fellowship to area college students. Howard and June Crowl, Nairobi, Kenya – The Crowls have served in Africa as missionaries for over 55 years, working in every level of church planting and leadership training, first in Zaire and now in Kenya. The Crowls are truly an awesome example of commitment to God and His Kingdom. Kris’s Kids Kare , Nairobi, Kenya – Chris Crowl has served over 35 years with ACM International. She cares for HIV babies that have been abandoned or are not adoptable. Ahadi Boys, Nairobi, Kenya – Aimee works with the Ahadi street boys in Niarobi, teaching them not only how to read and write, but sharing the love of Jesus with them. Pioneer Bible Translators – Nathan and Lindsay Davenport have a great burden on their hearts for the 800 language groups in Papua New Guinea, 400 of whom are now living without God’s Word in their language. 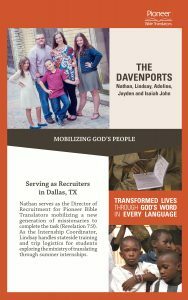 Their work is to recruit Bible translators and/or literacy specialists to put “God’s Talk” in each nation’s language. 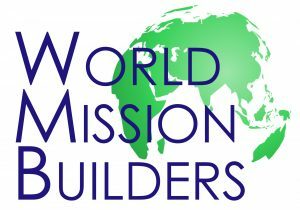 In 1999 R. Joe and N. Fae Wilson joined the ministry of World Mission Builders as the domestic coordinator. Joe is responsible for planning, recruiting volunteers, fundraising and the building of the domestic projects. Mioche Rock, Pasteur and Founder of Friends of Christ Haitian Ministry highlights some of several outreaches provided to help the people of Bouyaha and Pignon, Haiti. If you would like more information about how you might become involved in this ministry through work groups, support, or teaching some of the skills mentioned please contact: mrock3@juno.com.